Not long after Nevada Energy Metals expanded its presence in the Clayton Valley, the company announced it added claims to its San Emidio property. Keith Kohl of Oil & Gas Trader explains what this means to investors. It's only been a few days since we learned that Nevada Energy Metals Inc. (BFF:TSX.V; SSMLF:OTCPk) expanded its presence in the Clayton Valley. Well, we didn't have to wait very long to hear about the company's next move. 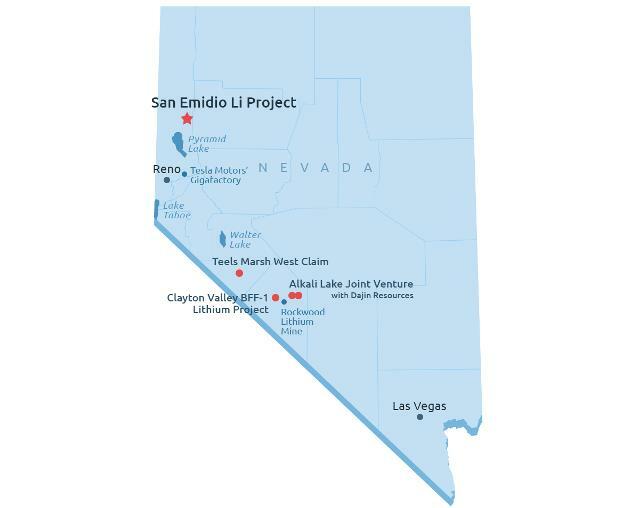 Nevada Energy Metals announced it has increased the exploration potential of the San Emidio property after adding an additional 69 claims to its position. In total, the company now holds 155 claims in the San Emidio Desert, located in Washoe County, Nevada, (roughly 95km northeast of Reno). Some of you may already recognize this lithium project from before. The San Emidio Desert basin is an alkali playa environment underlain by unconsolidated sediments and clays being fed by lithium bearing geothermal fluids reported in bounding faults, and/or faults along the east side of the basin. Moreover, this property adjoins the Empire geothermal power plant, which provides a substantial heat source for the circulation of meteoric groundwater, believed to be important in the formation of lithium brine deposits. According to the recent news, the new claims were staked to cover a portion of the playa (which is simply an area of flat, dried-up land, especially a desert basin from which water evaporate quickly) evaluated by Chevron Oil Company back in 1976 for its geothermal power potential. "Almost the entire survey area exhibits definite anomalous responses which have a true resistivity less than three ohm meters. The apparent resistivity data exhibits near horizontal contours throughout parts of the anomalous area, but there is also sufficient lateral variations with each anomaly to suggest that the conductive zone is not due entirely to conductive sediments." In order to confirm the presence of brine aquifers, however, the company is going to have to drill. Things are looking up, too. Previous results from operators that have explored the playa for lithium have reported lithium value sediments up to 312 ppm, and up to 80 ppm lithium in brine from a depth of 1.5 meters. The slight pullback since Friday has opened up an attractive buying opportunity, and Nevada Energy Metals remains a Buy for us at current prices, with a buy limit of CA$0.30 (or approximately US$0.23). Keith Kohl is the editor of Oil & Gas Trader. 1) Keith Kohl: I or my family own shares of the following companies mentioned in this interview: Nevada Energy Metals Inc. I personally am or my family is paid by the following companies mentioned in this interview: None. My company has a financial relationship with the following companies mentioned in this interview: None. I determined which companies would be included in this article based on my research and understanding of the sector. Statement and opinions expressed are the opinions of Keith Kohl and not of Streetwise Reports or its officers. Keith Kohl is wholly responsible for the validity of the statements. Keith Kohl was not paid by Streetwise Reports for this article. Streetwise Reports was not paid by the author to publish or syndicate this article. 2) The following companies mentioned in the article are sponsors of Streetwise Reports: None. The companies mentioned in this interview were not involved in any aspect of the article preparation or editing so the expert could comment independently about the sector. Streetwise Reports does not accept stock in exchange for its services. The information provided above is for informational purposes only and is not a recommendation to buy or sell any security.